An article published on Monday in Nature Geoscience argues that the reason the American West is falling short on ozone pollution reduction may have less to do with their own efforts, and more to do with China. Western U.S. emissions of ozone-forming pollutants decreased by 21 percent. The benefits of this large decrease will continue to accumulate for many years, like compound interest. By 2010, however, the decrease should have created a drop of more than two percent in mid-tropospheric ozone. Instead, there was no drop at all. 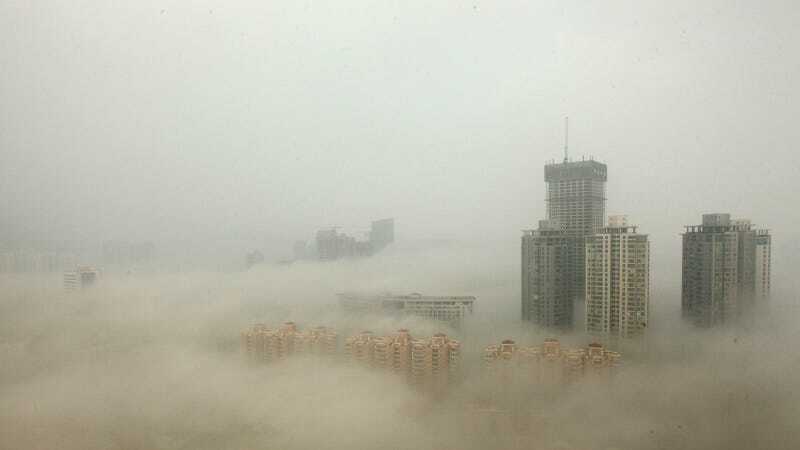 Researchers found that the concentration of ozone in the tropospheric ozone over China increased by seven percent from 2005 to 2010, both because of a rise in Chinese ozone emissions and because of how ozone travels in the atmosphere. That increase led to a 43 percent offset of U.S. efforts to cut down on ozone pollution. The mid-tropospheric zone is roughly 10,000 to 30,000 feet above ground level, NASA explains. Ozone in that area causes a greenhouse effect on Earth, making it a major contributor to global warming. According to study co-author Jessica Neu, some of what their analysis shows is a result of ozone that had been in the stratosphere descending into the troposphere—a naturally occurring process. "The large contribution from the stratosphere is part of a natural up-and-down cycle of upper-atmosphere winds. We know pretty well what will happen to the stratospheric contribution in the next few decades; it will continue to go up and down every two years or so," she said. But, she added, China's pollution played a significant role in our own ozone woes: "The contribution from China increased steadily throughout the study." Another co-author, the Royal Netherlands Meteorological Institute's Willem Verstraeten, put it more bluntly: "The dominant westerly winds blew this air pollution straight across to the United States…In a manner of speaking, China is exporting its air pollution to the West Coast of America." This is not the first time that China has affected the United States' environment. Los Angeles experiences at least one extra day a year of smog that exceeds federal ozone limits because of nitrogen oxides and carbon monoxide emitted by Chinese factories making goods for export, the analysis found.